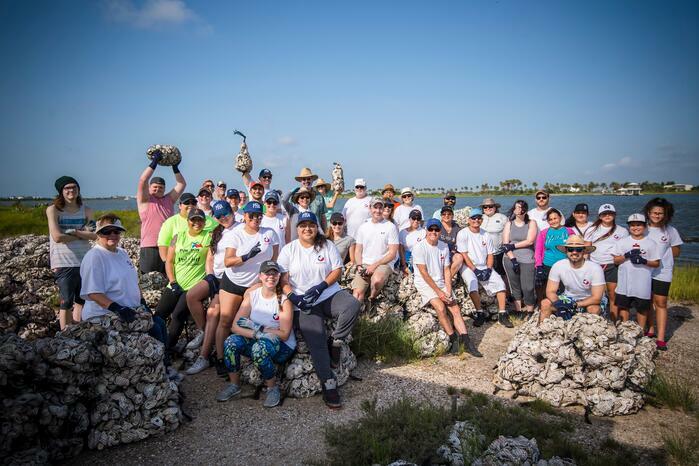 Despite the summer heat, Port Houston employees and their families rolled up their sleeves and worked together to construct 55 feet of new oyster bar and plant over 750 stems of cordgrass to create new marsh habitat. Environmental projects like these play an important role in improving water quality and help keep the bay healthy and sustainable for the future. Oyster habitats are vital to the health of Galveston Bay, acting as natural water purifiers that effectively filter nutrients, fine sediments and toxins from the water column. In fact, a single oyster can filter up to 50 gallons of water a day. Oysters are also a valuable indicator species, meaning that their presence in the water can be used to gather information on the overall health of our bay and its waterways. In addition to the volunteer project, the Port of Houston Authority has a five-year lease agreement with the Galveston Bay Foundation for its oyster shell recycling program. The property leased to the Foundation is used to store, clean and cure the shells before they are returned to the bay to create new reefs. “We truly appreciate the partnership we have created with the Galveston Bay Foundation, and enjoy the opportunity to play a role in this important environmental stewardship project,” added Berg.